« Is Government Debt a Problem? So, when it comes to reducing the size of government (and thus freeing the more productive private sector) I’m not so sure the Ryan budget will pan out to satisfy Mr. “Mitchell’s Golden Rule”. But, of course, all this if the Ryan budget is even ever implemented… which it won’t. Because the Ryan budget is not the middle-road proposal along the national political spectrum. In political terms it represents the radical Ryan recommendation of the ruthless right. 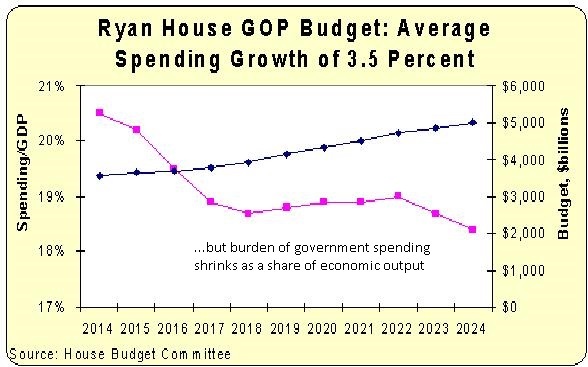 So, America’s general trajectory is as follows: The Ryan budget, something that will merely arrest America’s decline, lies at the extreme end of the political spectrum. All the other proposals, including the “compromise” that will eventually be adopted by the legislative chambers, are simply paths to various rates of American decline. America’s percentage of world GDP will continue to shrink, and the significantly above world average standard of living that American voter-lemmings have grown accustomed to taking for granted will end. I guess, in a leftist sense that is progress, since it will lead to more “worldwide equality and fairness”. There are only two obvious ways to achieve more equality: Raising the standard of living at the bottom, or depressing the standard of living at the top. Unfortunately, the former cannot be achieved with redistribution, because that inevitably flattens the effort-reward curves and thus leads to systemic lower growth and thus erosion of relative standard of living in a fast growing world. So, we will get the latter. …per month. Sure, there’s fairness and equality,… at the $9/month level. But if equality is so important then it takes precedence over absolute prosperity. So many leftists would feel poorer but happier in more equal Argentina than in more unequal Singapore…. until they actually have to live there. But, in more practical and personal terms,… can’t we, the current generation of Americans, just hope to coast along, living semi-happily the next four decades or so, while the country declines and then let someone else deal with any potential future problems, by emigration or other means? In my view, I don’t think so, I don’t think there is so much time, because some things in the world are highly non-linear. It will not be an orderly and gradual decline as we get from government consuming and dictating 38% of GDP to 60%. We only have a few percentage points of advantage left until we drop out of the group of most competitive nations in the world; a position of advantage Americans have taken for granted for more than a century now. When that threshold is crossed, and may have already been crossed, distortion will accumulate fast, and has likely already accumulated. Past that point, all hell will break loose. A sudden crisis and radical things, like the overnight imposition of VAT, and a definitive path to permanent expungement of the American miracle may be just around the corner. That is why those long term forecast graphs showing a neat trendline of government growing to 60% GDP over decades are just bogus. The real world is much more unstable with impending vicious cycle traps everywhere along the way and great inflection points. So will it be a slow wretched decline, a series of stepwise decline crises separated by relative calm? A combination thereof? Will American voters be slowly frog cooked in the very soup they themselves prepared? Human systems are too complex to predict the details of such declines. Detailed predictions depend on often minute details that determine the weakest link that must first give way to the accumulating distortion. But just because the details cannot be predicted, does not mean that one can hope in the invention of perpetual motion machines of prosperity (Krugmanomics) anytime soon. They never existed and likely never will, but have been sold to countless electorates to their own self-destruction. A demotivated country full of unambitious citizens living in a flat effort-reward welfare state cannot produce enough to sustain exceptional prosperity, no matter how Paul Krugman and his followers imagine coercively drafting and organizing the working human citizen bees. But no politician can tell that right to the voter’s faces. Even “radicals” such as Mr. Mitchell have to be careful not to offend the majority of domestic voters. Now don’t get me wrong, I admire and respect Mr. Mitchell as an exceptional individual and I would ultimately have the same pitchfork apprehension if I were in his place — or if I had to use my real name on this blog for that matter. But one must understand that this is the reality of public life. Understanding that reality helps one make much better decisions at the personal level — like getting in the poison business when a majority of voter-lemmings have decided to commit societal suicide anyway. The serendipitously lucky history of America has made American voters grossly ignorant and naïve about the vicious cycle (the malaise of decline prompts demands for even more redistribution at the next election, even flatter effort-reward curves, even less motivation, even more decline…) and the great discontinuities of a competitive world, where a 3% loss of competitiveness can easily translate into a 30% loss of standard of living (real or diminished with respect to potential). Business suffers from an inefficiency which doesn’t apply to government. What business spends is not automatically GDP (useful production). Business output is the added market value of what it produces. Someone has to buy it for it to be GDP, and we must subtract the value of purchased inputs. This is unreliable and complicated. Sometimes, a business can even reduce GDP if it loses enough money. No one can really tell if government produces GDP, so it has decided that everything government spends is GDP by definition. There is no need for anyone to buy or value the output. It won’t make a profit under this rule, but there are no losses either. If government were to spend less, then we would all have to deal with the immediate hardship of less GDP under that policy. That is less economic growth and less prosperity, according to the various accounting agencies employed by the government. Every bit of government spending is useful or a multiple of useful by government accounting definition. So, it is always good to raise taxes, or borrow, or create more money to increase government spending. GDP goes up safely and reliably with no risk. Plus, we are assured that production goes up by a multiple of 1.5 to 4 times government spending. It is a mystery that we don’t have the government spend everything, so that we could all be rich. But, I guess they are busy doing their current volume of work. It is sad that government cannot be even bigger, but we can work on this.